Happy 70th birthday, Sylvester Stallone! In honor of the big guy's big day, we thought we’d round up a few facts you may not have known about one of Sly’s most iconic characters. Lock and load! 1. RAMBO IS NAMED AFTER AN APPLE AND A POET. First Blood (1982) was adapted from writer David Morrell’s 1972 novel of the same name. Morrell named the character “Rambo” after a type of apple cultivated by a 17th-century Swedish settler named Peter Gunnarson Rambo. 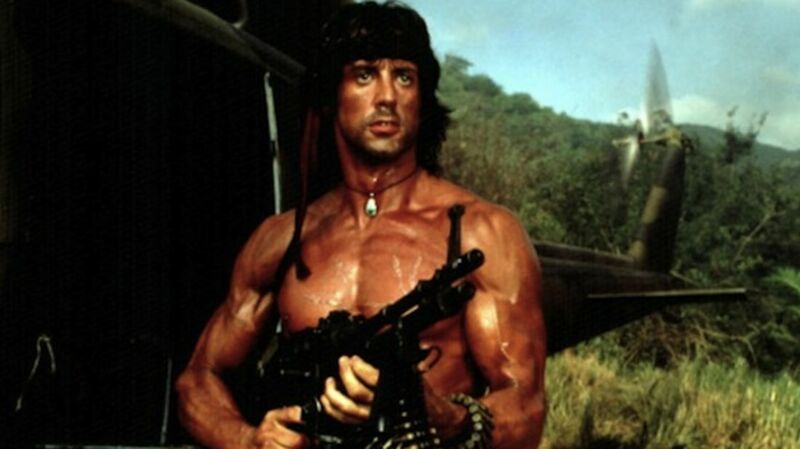 In the book the character didn’t have a first name, but in the movie he was given the full name John Rambo. 2. HE’S BASED ON A REAL-LIFE WAR HERO. Morrell first thought of writing a book about a decorated war hero struggling to assimilate back to civilian life when he read about the real-life exploits of World War II soldier Audie Murphy. Murphy was the most decorated American soldier in World War II, earning every possible U.S. military decoration for valor as well as five separate decorations from foreign countries including France and Belgium. Following the war, Murphy starred as himself in the film adaptation of his own autobiography, To Hell and Back, and would go on to have a film career, appearing in 44 feature films. Murphy—who later suffered from severe post-traumatic stress disorder, which also inspired Morrell’s characterization of Rambo—tragically died in a plane crash in 1971. The Canadian-born Morrell decided to update his novel to the post-Vietnam era due to the political and cultural climate he saw as a grad student at Penn State in the late 1960s. Morrell would go on to write the novelizations of the second and third Rambo movies. Since he had Rambo die at the end of the first book he had to retroactively change that to have his hero alive and well in the subsequent books. 3. SYLVESTER STALLONE DIDN’T WANT TO BE RAMBO. The film rights to Morrell’s book were optioned by Columbia Pictures in the early 1970s, then passed to Warner Bros. and continued through the studio system for 10 years. It became the most optioned project in Hollywood between 1972 and 1982, until the rights were bought by independent producers Mario Kassar and Andrew Vajna. More than 26 drafts of the story were written during the decade of development and dozens of actors signed on and dropped out of the role of Rambo including Steve McQueen, Paul Newman, Clint Eastwood, Al Pacino, Robert De Niro, Nick Nolte, John Travolta, and Dustin Hoffman. Stallone was brought on when director Ted Kotcheff offered him the part because of his popularity in the Rocky franchise, but Stallone turned him down because he felt that the role had passed through too many actors and the movie would never really get made. He later committed to the role when he was offered the opportunity to rewrite the screenplay (his $3.5 million salary may also have helped) in order to make Rambo more sympathetic as opposed to the PTSD-crazed madman the character resembled in the novel. 4. RAMBO DOESN’T ACTUALLY KILL ANYONE IN THE FIRST MOVIE. Despite his notorious reputation for shooting first and asking questions later, Rambo doesn’t actually do anyone in in First Blood—he only severely wounds the people trying to hunt and harm him. This was a conscious effort on Stallone’s part in his script to change the character into an underdog from the character in the book who, due to his PTSD, goes on a wild killing rampage, which Stallone felt would alienate the audience. The one character who does die is Deputy Galt, who tracks Rambo through the mountains in a helicopter. Galt, who attempts to shoot Rambo with a rifle, loses his balance and falls from the helicopter after Rambo merely throws a rock toward it to defend himself. Like the book, Rambo himself was to die at the end of the movie at the hands of Colonel Trautman. The scene where Rambo is killed was filmed, but was scrapped after test audiences hated the fact that it seemed to imply the only way for veterans returning home to cope was by dying. 5. KIRK DOUGLAS WAS SUPPOSED TO PLAY COLONEL TRAUTMAN. The veteran movie star actually made it to set and appeared in early advertisements for First Blood, but left the production when he demanded the right to rewrite the script. Douglas favored the ending of the book, and felt that Rambo should die in the end. The actor gave the filmmakers an ultimatum: if the production didn’t let him do what he wanted with the script he’d quit. Kotcheff and Stallone wanted to leave the door open for the possibility for Rambo to live or die at the end of the movie, so they let Douglas quit. Actor Richard Crenna was then cast with a single day’s notice to fill Douglas’ shoes as Rambo’s mentor and father figure, Colonel Trautman. Crenna would reprise his role in two more Rambo movies before he passed away in 2003. He is the only actor besides Stallone to appear in multiple Rambo movies. The unused alternate ending of First Blood, in which Trautman shoots and kills Rambo, can be seen briefly in the dream sequence in the fourth film, Rambo. 6. RAMBO’S KNIFE WAS CUSTOM MADE. Stallone personally selected famed knifemaker Jimmy Lile to design and create the iconic knife first used by Rambo in First Blood. The goal was to create a knife that could be reliable for extreme survival situations, including being long and sharp enough to slice food or cut wood; waterproof and able to hold necessities like matches and medicine; able to carry a nylon string for fishing or snaring; and have an alternate blade of sawteeth for defense and in order to cut poles for shelter. In all, six knives were created to be used during production of First Blood, with additional updated versions made for subsequent movies in the series. 7. FOR RAMBO: FIRST BLOOD PART II, JAMES CAMERON WROTE THE ACTION AND STALLONE WROTE THE POLITICS. Initial drafts of the screenplay for the sequel to First Blood were written by James Cameron, who at the time was still looking for his big break. Cameron’s script, which was titled First Blood II: The Mission and was written simultaneously with the scripts for The Terminator and Aliens (two movies which ultimately gave him that big break), differed substantially from what ended up on screen. According to Cameron: “I was trying to create a semi-realistic, haunted character, the quintessential Vietnam returnee, not a political statement." Cameron’s draft picked up with Colonel Trautman finding Rambo in a psychiatric ward (a concept Cameron would recycle for his Sarah Connor character in Terminator 2), and also featured a sidekick role named Lieutenant Brewer that producers hoped would be filled by John Travolta, who Stallone had recently directed in the 1983 Saturday Night Fever sequel, Staying Alive (yes, you read that correctly, Sly directed the sequel to Saturday Night Fever). Eventually Stallone took over scriptwriting duties, and excised the first half of Cameron’s screenplay to add the film’s prominent POW/MIA message and the love story beats with the character Co-Bao. Rambo: First Blood Part II is the only Rambo movie to be nominated for an Oscar. It received a nod for Best Sound Effects Editing in 1986 but lost to Back to the Future. 8. THE VIETNAMESE JUNGLE IS ACTUALLY MEXICO. Director George P. Cosmatos, who was hired by the producers because they loved his previous movie Of Unknown Origin, originally wanted to shoot the movie in the city of Chiang Mai in northern Thailand, which proved to be logistically and financially impossible for such a massive production. Instead, they shot the movie entirely on location in Acapulco, Mexico because it was cheaper and closer to the U.S.—not to mention they could stay on the beautiful beaches in the area while shooting. The Mexican jungles doubled for Vietnam, and the production cleverly inserted small details in an effort to make it seem like they were in Asia. For instance, the massive Buddha statue seen in the opening credit sequence was created entirely out of gold-painted Styrofoam and shot in the parking lot of the production’s Acapulco beach resort hotel. It was then painted over again and used in the jungle temple where Rambo meets Co Bao, which was a set created by the production only 10 minutes away from their hotel as well. The U.S. military base where Murdock oversees the operation actually belonged to the Mexican Air Force, as did most of the aircraft seen in the movie. The most costly location was an actual rice paddy that was planted by the production and used during the scene where Rambo attempts to escape with the POWs. The only thing that Cosmatos requested but couldn’t get were native Vietnamese water buffalo; they proved too costly to import to Mexico. 9. MEXICO WASN’T THE PARADISE THE FILMMAKERS THOUGHT IT WOULD BE. The beachfront digs at least made the potentially grueling production a bit easier … that is until Hurricane Odile destroyed most of the sets during shooting in September of 1984. The setback caused the production to shut down temporarily, which forced Cosmatos and Stallone to have to think fast. In order to make up for lost days, they decided to shoot insert shots and close-ups at their hotel while production got back up and running. One of these scenes was the famous “suit-up scene” showing Rambo prepping the arsenal of weapons he initially takes on his mission. The influential scene has since been copied and parodied numerous times in subsequent films. 10. TO BECOME RAMBO, STALLONE HAD A RIDICULOUS WORKOUT SCHEDULE. First Blood required Stallone to be ripped (he shot Rocky III shortly before starring in the first Rambo movie, which helped), but for the second outing he really needed to pump some iron. The actor trained for eight months prior to the film’s start date in late 1984, but he maintained a strict regimen during shooting as well. He would begin with a two- to three-hour morning workout, then he’d move on to the 10- to 12-hour shooting day on the movie. After that, instead of going home like the rest of the cast and crew, he’d cap off the day with another two- to three-hour workout. After six hours of sleep or so he’d be up and ready to do it all again. Maintaining that physique definitely helped Stallone for his next movie as well: he began shooting Rocky IV immediately after First Blood Part II. 11. A LINE IN RAMBO: FIRST BLOOD PART II INSPIRED A NEW SLY STALLONE TRILOGY. Twenty-five years later, Stallone would develop and co-write The Expendables, an ensemble action movie starring Stallone and a handful of his fellow 1980s action stars, about an elite group of mercenaries given high-risk missions. Stallone confirmed that the title of the film came from dialogue in First Blood Part II. The Expendables movie would go on to spawn two sequels with a potential fourth installment, a TV series, and an all-female spinoff—cheekily titled “The Expendabelles”—in development. 12. RAMBO III’S ORIGINAL DIRECTOR LEFT TWO WEEKS INTO PRODUCTION. Russell Mulcahy, the original director of the third installment of the Rambo series, was fired two weeks into the production of the movie due to creative differences. The eventual director, Peter MacDonald—who was originally hired as a second unit director—was given only two days notice before picking up where Mulcahy left off (only portions of the footage directed by Mulcahy remain in the final film). The prospect of picking up any job, let alone a multi-million dollar franchise, with only two days’ notice would be extremely tough. Not only was Rambo III MacDonald’s debut as a director, but the $63 million production was also the most expensive movie ever made up until that point. 13. THE TIMING OF RAMBO III’S RELEASE WAS REALLY POOR. The plot of the third movie involves Rambo teaming up with Mujahideen fighters in Afghanistan (funny enough, the movie was mostly shot in the deserts of Israel) to combat Russian soldiers and save Colonel Trautman during the Soviet-Afghan War. The storyline attempted to continue the anti-Soviet slant of the series that began in the second installment … that is until history stepped in. Around the time the movie was in post-production in late 1987, aiming for a May 1988 release, Soviet leader Mikhail Gorbachev began implementing glasnost, the official easing of tensions and increased transparency between the U.S. and the USSR toward the end of the Cold War. Then, 10 days before Rambo III’s release, the Soviet Union began withdrawing troops from Afghanistan altogether, deflating the main thrust of the movie’s anti-Soviet premise. 14. THE END DEDICATION WAS CHANGED AFTER 9/11. The movie currently ends with the quote, “This film is dedicated to the gallant people of Afghanistan,” but when it was first released in 1988 the dedication read, “This film is dedicated to the brave Mujahideen fighters of Afghanistan.” The change was made because Mujahideen fighters had been linked to Al Qaeda following the September 11th attacks. 15. RAMBO COULD HAVE BEEN IN A DIFFERENT SITUATION IN THE FOURTH MOVIE. When Stallone decided to revisit the story of Rambo 20 years after the third movie, the original idea for the fourth installment involved Rambo helping to rescue a woman in Tijuana, Mexico. According to Stallone, early ideas for the movie were to emphasize illegal immigration as a focal point but the idea was scrapped because he wanted to keep the character in a jungle setting. Stallone introduced the idea of setting the movie in Burma after reading about protests that led to the events of the Saffron Revolution and the ongoing civil war conflict between the Myanmar military and Karen rebels, which he felt wasn’t being properly covered in the Western media. 16. RAMBO IS BANNED IN PRESENT DAY MYANMAR. Stallone, who directed and co-wrote the fourth movie, sought input from the Burmese people to tell their story, going so far as to cast many non-actors as extras. Maung Maung Khin, who plays the evil Myanmar General Tint, is actually a former Karen rebel freedom fighter. Because of this anti-Myanmar government perspective, the film is banned throughout the country.